Attention runners and fans of Olympians! 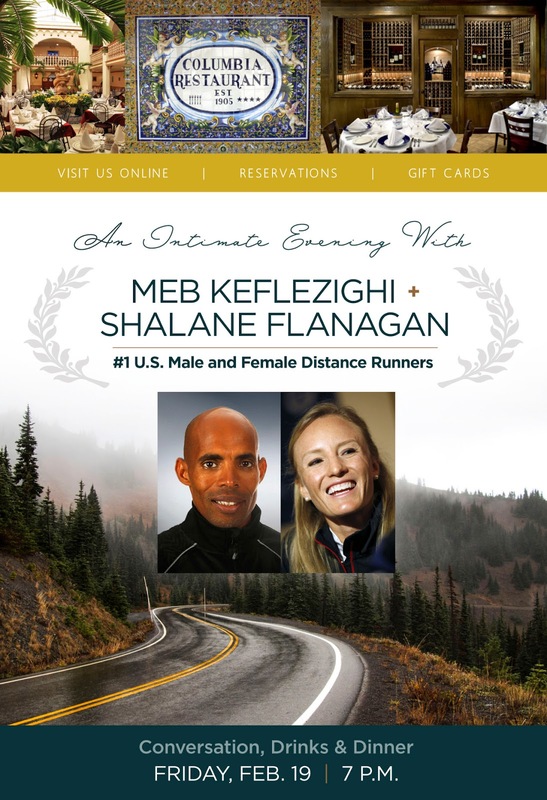 Meb Keflezighi and Shalane Flanagan will be at Columbia Cafe at the Tampa Bay History Center on Friday, February 19th! These two amazing athletes are hosting an intimate evening and it is your chance to be up close with USA's #1 Male and Female distance runners. I am sadly out of town on this night or we would have been there without second thought. 100% of the revenues goes to the Advanced Prostate Cancer Collaboration at Moffitt Cancer Center. At the 2008 Olympics, Shalane finished third and became the second American to win an Olympic medal in the women’s 1,000 meters. She also set a new American record in 30:22.22, shattering her own American record set earlier that year. She has been one of the U.S.’s top cross country runners for more than a decade.